Schooling from the heart: Have you seen Jack-in-the-Green? I was just over at A Polar Bear's Tale-- she is always putting such inspiring artwork up-- when this one in particular caught my eye. 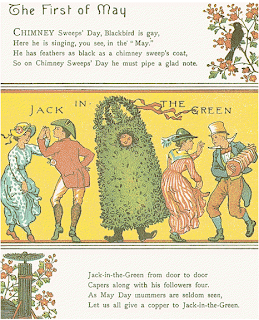 I had no idea that Jack-in-the-Green was associated with the first of May. To me it has always been a song... still remembered from childhood. And always, it makes me think of my dad. He and I were blessed enough to see Jethro Tull play live, twice. Though my dad has been gone six years this May, I can still hear him singing along. I found a nice little video of Jethro Tull singing Jack-in-the-Green, 1982. Hi Sara! Thanks for linking to my blog! Glad YOU posted Jethro Tull!! A blessed May to you and your family!! That's a darling picture and a special story about your dad. I'm glad you have that memory in your heart. What a special memory...and thank you for sharing it. I'm sure it brought a smile to your dad's face!